This house in Macclesfield has two 4kW solar PV systems that were fitted by another company to ourselves. The householder was aware that the majority of the electricity produced by his arrays was being exported to the grid and wanted to do something about it. 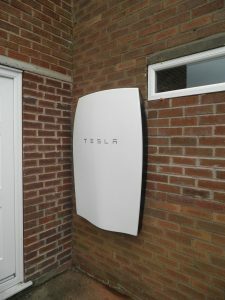 He was interested initially in a Growatt SP2000 but as one of the few Tesla Energy Certified Installers we were able to offer him a Tesla Powerwall home battery. We specified an a.c. coupled system using SolarEdge equipment. 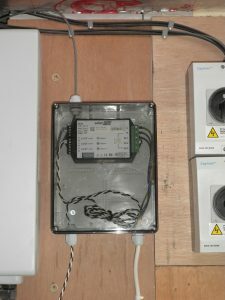 This comprises an inverter, interface and a meter than measures import and export to the house. 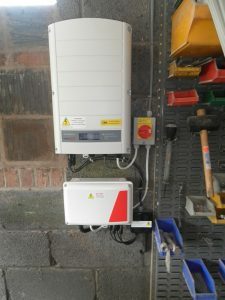 The battery is mounted onto the gable wall of the house, with the inverter and interface on the other side of the wall in the garage. Installation took around four hours from our arrival.